You are here: Home / Blog / Happy 90th Birthday, Jim Whittaker! Living legend Jim Whittaker turns 90 today. Join us in wishing the first American to summit Everest and the first employee of REI a very happy birthday. Jim Whittaker, a living legend among mountaineers worldwide, is a father, husband, environmentalist, and author. He is recognized as one the most influential climbers in American history, and is a visionary business and community leader in Seattle and the Pacific Northwest. We're proud to count 'Big Jim' as a Mountaineers member, and invite you to join us in wishing him, and his twin brother Lou, a very happy 90th birthday today! Jim and Lou are Washington locals, and their love of climbing began at an early age in the Arbor Heights neighborhood of West Seattle. With a home on the top of a hill, each day they began with a descent to Fauntleroy School, where they attended K-5, or to Lincoln Park, where they would often paddle in homemade rafts. Each trip meant another trek back uphill to get home. "We were up and down that hill all the time, so maybe that's where it all began," Jim said in an interview with the Seattle PI. "That's how we came to be in such good shape." 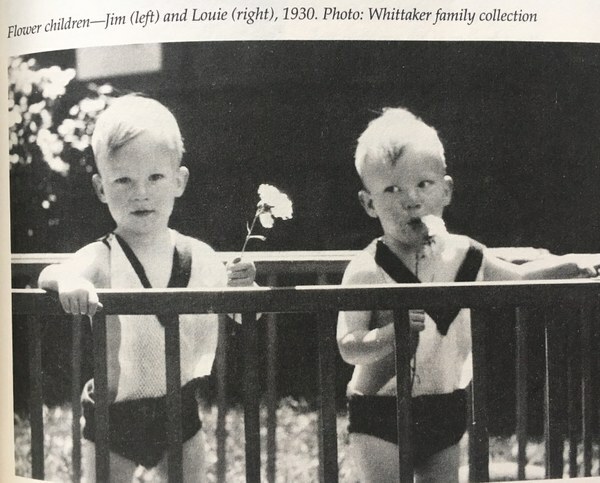 The twins began their official climbing careers in the 1940s with the Boy Scouts, and eventually became members of The Mountaineers and the Explorer Scouts climbing group. They began guiding climbs on Mount Rainier, and by 1948 were tapped to help run the guide service on Mount Rainier, taking over full management the following year. In the off season, Jim attended Seattle University and sold gear as a ski gear rep. At the outset of the Korean War, Jim and Lou were drafted into the Army and sent to a Signal Corps detachment in California. From there, they transferred to the Army’s Mountain and Cold Weather command in Colorado. In January 1953, Jim and Lou arrived at Camp Hale, Colorado. Their job was to train an elite group of soldiers - the 10th Mountain Division - to execute wartime missions in unforgiving alpine conditions. Using the skills they learned with The Mountaineers, and honed as mountain guides on Mt. Rainier, Jim and Lou trained the soldiers in skiing, climbing, mountain maneuvers, and bivouacs. 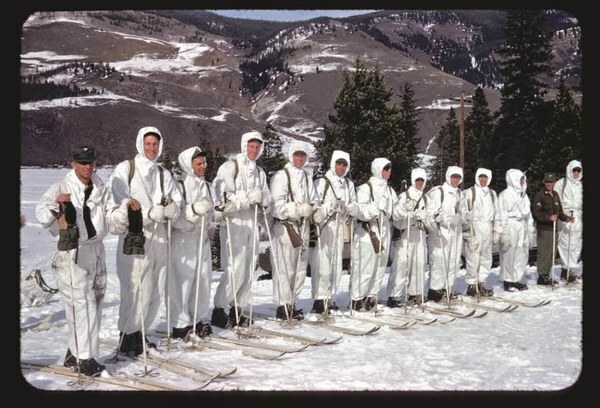 The two tallest members, it's easy to pick out Jim and Lou in the 10th Mountain Division. Jim continued running the store, and took time away to lead many notable clients on expeditions in the Pacific Northwest and Alaska. On one such climb to Denali with businessman John Day - who sought to set a speed record on the on the South Summit via the West Buttress - Jim, along with Lou and famed climber Pete Schoening, were involved in an accident, stranding the four climbers for four days at 17,200 feet. After a harrowing rescue of John and Peter by renowned bush pilot Don Sheldon, Jim and Lou walked out under their own power. These experiences set the stage for Jim to become the first American to summit Everest, alongside Sherpa Nawang Gombu, on May 1, 1963. His success was heralded nationwide. A parade was thrown in his honor in Seattle, and Jim was awarded the Hubbard Medal by President John Kennedy. 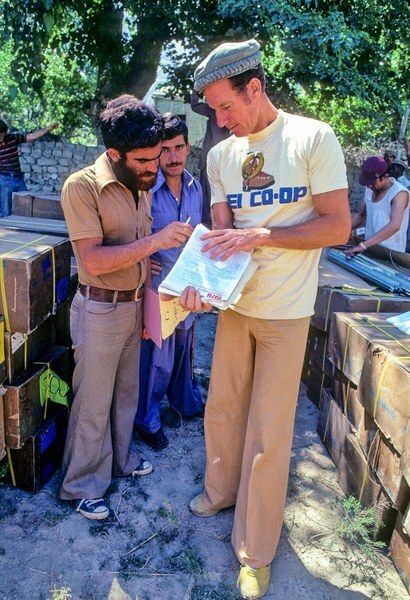 Jim talking with porters during the 1978 K2 expedition, sponsored in part by REI. Photo by Dianne Roberts. In 1978, Jim led the expedition that saw the first Americans at the summit of K2. The trip had many firsts, including the world's highest overnight bivouac wherein Jim Wickwire survived a harrowing night above 27,000ft. "The truth is we couldn’t have climbed K2 without Jim Whittaker’s strong and enthusiastic leadership and the dogged work of the entire team," said Jim Wickwire, who with Lou Reichert was the first to summit K2. "Only together did we share in pioneering the route and carrying load after load." Read more about this trip in Wickwire's first-hand account. 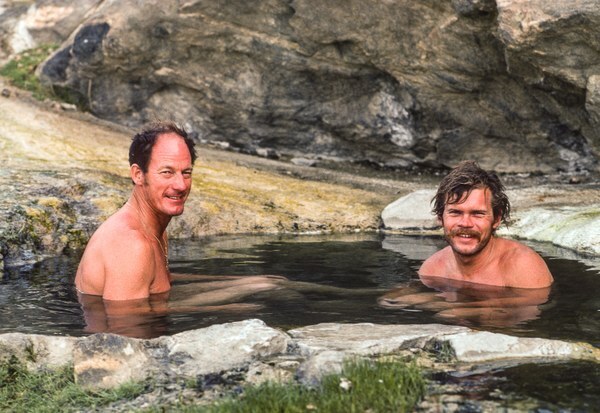 Jim enjoying a soak in a natural hot springs with Rick Ridgeway during the 1978 K2 expedition. Photo by Dianne Roberts. In the spring of 1990 - when the US, China, and Soviet Union were Cold War enemies and real war seemed imminent - Jim organized and led the Mount Everest International Peace Climb. "The expedition not only focused on peace and the environment," said Jim, "it fostered a global mountaineering community and inspired efforts to save a young life." At a time when teamwork between these three countries seemed unattainable, the Peace Climb proved that tremendous heights can be reached by working together in cooperation toward a common goal. Over a four day period, 20 climbers from the team reached the peak. "But climbing the mountain together was not our only goal. We also had an important environmental message to send to global leaders: the year 1990 marked the twentieth anniversary of the first Earth Day, and standing on the highest point on earth, where there is not enough oxygen to keep you alive, makes you realize how fragile this planet is." In addition to a successful summit, the team also removed more than two tons of trash left by previous expeditions, setting the stage for future trash removal efforts. 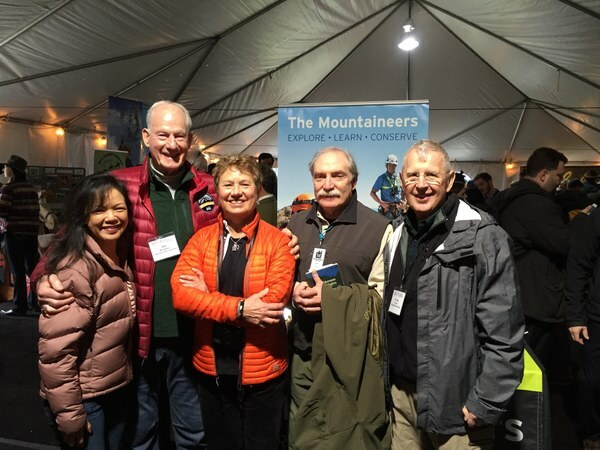 Second from left, Jim, and his wife Dianne (center) advocate for outdoor recreation and conservation in Olympia as part of the Big Tent Rally. While not climbing mountains and running a successful business, Jim spends time with his family. An accomplished blue-water sailor, Jim twice skippered his own boats on the 2,400-mile Victoria-to-Maui International Yacht Race. He and his wife Dianne Roberts, along with their two sons, made a four-year, 20,000-mile Pacific sailing journey to Australia and back to their home in Port Townsend, Washington, aboard their 54-foot steel ketch, Impossible. Their youngest son Leif, having published a memoir titled My Old Man and the Mountain jokes that he wants to write a book with Dianne about their time at sea, titled My Old Mom and the Sea. Today, Jim Whittaker is still regarded as a seminal figure in North American mountaineering, as well as an astute businessman who helped create the outdoor recreation industry. His accomplishments — in the mountains and in life — are captured in A Life on the Edge, by Mountaineers Books through our Legends and Lore series, a special imprint that keeps important mountaineering stories alive for the next generation. 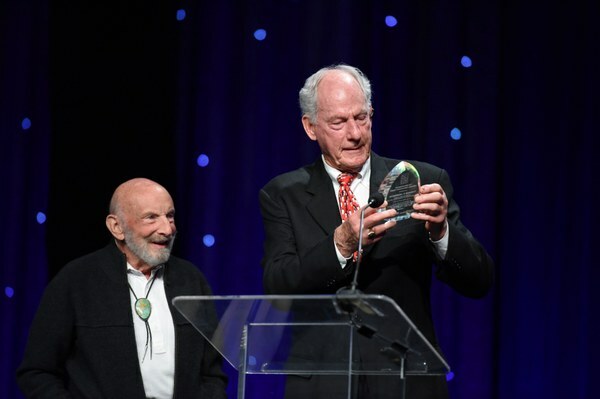 Jim presents The Mountaineers Lifetime Achievement Award to teammate and "Everest rival" Tom Hornbein. Jim continues to advocate for the environment and for "no child left inside". At a recent Mountaineers Gala, he advocated for "more green time and less screen time". We sincerely thank Jim, and his wife and esteemed mountaineer and photographer, Dianne Roberts, for a life of dedication and contributions to The Mountaineers legacy. Happy Birthday, Jim and Lou! I bought my first ice ax from Jim at the old Capitol Hill REI store. Happy Birthday Jim. I sailed with you on Impossible - Swan 441.